Verzija 1.4.2, posljednji put ažurirana 13. април 2016. Doesn't open files automatically on the newest version of opera; i.e requires you to manually open the file from the promp. Still an improvement over default Opera but not what I'm looking for. Sorry to say this. But, as long as Opera does not change the dicision, a one-click-opening-opertunity will not exist. My aim was not to override this but to make the process a bit more comfortable. For me, the most important thing was to reduce the trash in the download folder when you research certain topics. You are welcome to give me some hints what can be improved and I can try to find a solution. Thanks. Sorry for the late answer. Could you please describe the behaviour a bit more in detail? What about your chrome pdf reader plugin? Is it disabled? What else happens? Please, give me some feedback. Thanks in advance. The extension has stopped working again please fix it. Could you please go more into detail. Is there a specific link that does not work? Does the extension does not work in any case? Which operating system do you use? I need some more intel to know where to start searching. Debian 9 Stretch users should disable opera://flags/#linux-libnotify-toasts. Clicking the notification, no matter where, only closes it. It is not related to the extension itself. This is simply a problem of Opera or libnotify. 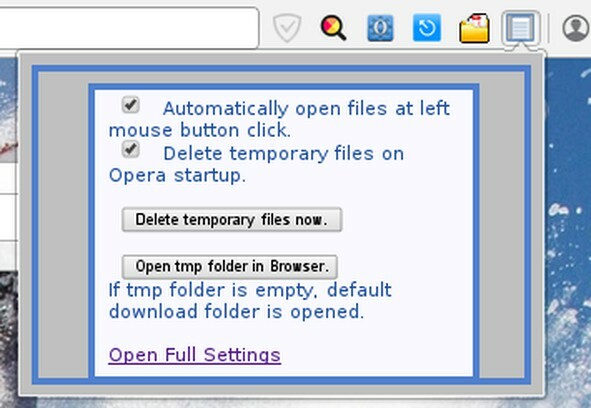 Old Opera had the option to open local files directly without downloading, eg. with Libreoffice so you could modify them "in place". This allowed to use a startup page as a kind of "work menu" in Opera. Firefox itself still allows this. 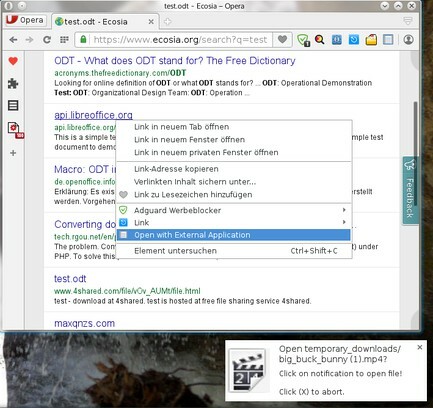 Also Opera 12 allowed to pass urls directly to external apps. It was beautiful to instantly stream videos in VLC with a single click, instead of having to download the whole file before being able to play it. Could any of those two options be enabled in your extension? Hello. The new Opera is bulit on the chromium-api. This makes several thinks complicate. I guess your files are not within in the download folder. For files in the download folder there might be some dirty trick to do the job. Open streams in VLC may be possible if a streaming address exists. Such addresses also have MIME types and have a small size. The command to open a file opens 'the downloaded file now if the DownloadItem is complete; otherwise returns an error through runtime.lastError.' That means there is no other way but to wait until the download finished before watching it. I try to find some ideas that can be implemented in the next release of this extension. Maybe there is a way of partially downloading a file and make the system thing it is finished, open it and then continue downloading. - detect if the downloading finished and then perform the action that was remembered before. 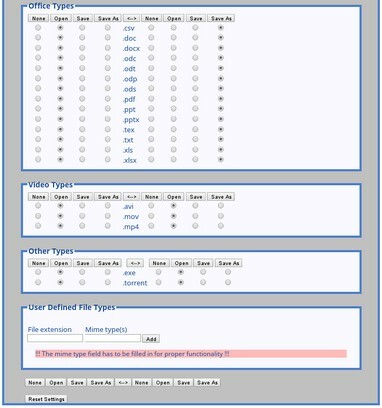 I'm not a skilled programmer for JS and Opera and I can't say, what are the API limitations, but the above requires some kind of a list that is maintained during download process to execute the chosen action when the file is downloaded. Also, using the list of extensions it would be possible to decide if the file should be handled by the extension or not (then the other plugin action - like for streaming could be performed). This way it shouldn't be required to handle every type of download and it shouldn't be required to open partially downloaded file.